Description: TSAL186 - Do you have an urge to merge the wild with the gentle, then pick one of these marble statues rome. The White Lion Water fountain speaks eon’s worth of combinations of the earthy wildness of the lion with the iridescent tranquil flow of the spew of water trickling from its jaws. Marble statues and fountains like these are possessed with a hand carved marble framework where the marble statue gives off a sheer of controlled fierceness. If you are interested in one of them as a water fountain statue, be sure to buy them at the earliest, as fine marble pieces, especially since these fountain statues are selling like hot cakes. 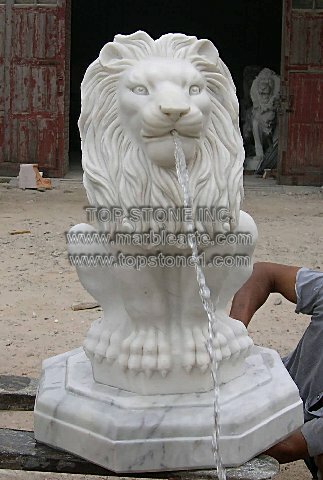 And what better way to invest in that finishing touch to your garden art than to buy a marble statue of a lion for your outdoor water fountain? So buy one today.